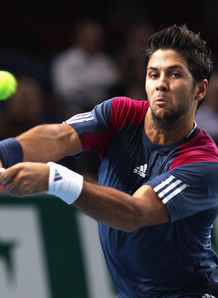 Third seed Fernando Verdasco crashed out of the Brisbane International at the first obstacle after losing in three sets to Benjamin Becker. A semi-finalist at the Australian Open in 2009, Verdasco's preparations for this year's event were contracted a blow as Becker beat him 6-1 6-7 (2-7) 6-3 in a little over 2 hours. The Spaniard looked to have overcome a lethargic start as he edged a second set tie-breaker, but was outplayed in the decider as Becker sealed a deserved victory and a second round fight with Colombia's Santiago Giraldo. "I had a good game diagram and it worked well today," 53rd-ranked Becker said afterwards. "It is forever good to get a win under your belt... and it’s not every day you beat a top 10 player." Somewhere else in the first round, fourth seed Mardy Fish came through in at ease style as he beat Alex Mannarino of France in straight sets 6-1 6-4, while Radek Stepanek beat Tobias Kamke, the Czech coming from a set down to triumph 5-7 6-1 6-4.